Favorite and Recommended Fairy Tale Films? It's Friday! I won't be regularly posting about Beauty and the Beast over the weekend--I've decided only special sales or other prompts will merit weekend posts going forward. I need a break! (I've thought this repeatedly as I've sat past midnight editing the next book. For months.) 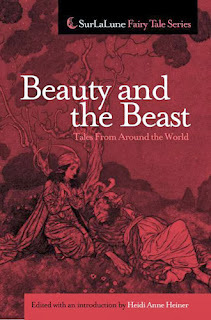 Starting Monday, I will begin my discussion on Beauty and the Beast, Villeneuve, Beaumont, and Animal Bridegroom tale types. There's a lot to discuss there! But that's too weighty to begin on a Friday. Gypsy, from Once Upon a Blog--who has thankfully been writing wonderful posts about fairy tale news the last few months, relieving my guilt over not doing so myself as often as I would love to--asked the other day why Beauty and the Beast is my favorite fairy tale. IT HAS been no secret for years that Beauty and the Beast was my favorite fairy tale as a child. It remains my favorite although many other tales have fought for that honor over the years. When I was six years old, my dear grandmother—Elizabeth “Betty” Johnson—spent a few months hunting down a copy of the tale for me when our searches during her Christmas visit failed to produce one, long before the days of online searches facilitated such work. She had asked me what I wanted and that was my single request, seemingly simple, but frustratingly not. Fortunately, she finally found it at a bookstore, not in a beast’s garden where the price may have been too high. I still have that original anthology she sent me as an Easter gift a few months later which nurtured my love for both fairy tales and the Golden Age of Illustration, for the illustrations of Walter Crane, Gustave Doré, and others graced its pages, too. The thing is, I don't remember first hearing the tale--it must have been at school, from a friend, or on tv, although my tv viewing was extremely limited at age 6 and under. The tv lived in closet quite often. My first memory is latching onto it and wanting a copy to read so there obviously wasn't one in my home. I have a feeling it had been resonating for a while, perhaps even a year or two, and that is what led me to asking for a copy, my frustration in not being able to read it or hear it over and over again. That would also explain why my first hearing of the tale is lost in shadows. But that anthology from Grams had Walter Crane's illustrations which still define the tale for me despite so many other beloved editions since then. First exposure has such grand power. And it was repeated exposure for I loved that book and managed to keep it to this day. Not an easy task with younger siblings and a mom who sorts out the house frequently. Years later, I discovered Robin McKinley's Beauty, which resonated. She loved books! He was kind! It was a fairy tale for someone over the age of five! After all, society in general was telling me that fairy tales were for little children. I was so very excited when Disney's film was announced and released. Then I saw it opening night. I was a sophomore in college. That's really the first time my critic jumped in. Don't get me wrong. There were parts I adored--the library, the music--but Gaston! and the Angry Beast! No siblings! Yikes. It was not my Beauty and the Beast. I've had a love/hate with it ever since. Honestly, I didn't learn about East of the Sun and West of the Moon and the rest until after that. My fairy tale education really came rather late, past childhood. I knew the basics like almost any child but the resources simply weren't there and the attitudes of those around me were not positive. Fairy tales were for little kids. Even fantasy was a questionable genre in the mainstream world I grew up in. It didn't stop me from reading it and loving it, but I was different. 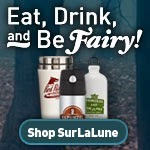 I would have been obsessed with a place like SurLaLune which is why I created it. And, well, I guess I am obsessed. But as I have studied the tale and the many Animal Bridegroom tales, I have never doubted that the messages of seeing beyond the surface of a person are a vital part of my personal philosophy and makeup. We are all subject to the visual--I'm married to a visual creative who is VERY keyed into the visual and my mother is the same--but I have a hard time remembering what people look like despite my Sherlockian dedication to other details. I tend to remember people according to what I found interesting about them, how they made me feel, who they seem to be below their physical surface. I've trained myself to be better about that but I still usually only retain nebulous information such as hair and eye color and general size. Heaven forbid I actually ever have to identify someone in a line-up. And that's why I may have a hard time remembering who you are until I am reminded of a conversation I've had with you or some other helpful information beyond your physical appearance. Even when I am reading, I don't tend to create images of characters in my head, I have a funny way of looking outward from their gaze, not looking at them. I rarely visualize them physically unless their physicality is critical to their character, such as Anne of Green Gables and her red hair. And for the other Search for the Lost Husband tales closely related to Beauty and the Beast, I am also charmed by the heroine's lack of perfection--she makes mistakes--and her desire to rectify them. She endures hardships. She attempts the impossible. She quests. She may be pretty but it isn't what defines her in the end. Often, she is rather clever by the end of the tale, too. Although if she is Psyche, she is still way behind the curve about listening to instructions. (I'll be discussing those differences between ATU 425A and 425B soon.) She isn't passive but acts, especially to correct her mistakes. She is quite inspirational that way. There may be magical help, but it's not as overwhelming as an overly generous Fairy Godmother, I'm looking at you Cinderella. And she doesn't sleep for years or repine in a tower or take a bite of that apple after multiple mishaps and warnings. And I love those tales, too, but not the same way I adore Beauty and the Beast. It took writing a book to make me really appreciate Snow White and like her, too. Finally, I am always sad when Beauty and the Beast is interpreted as justifying abuse in relationships. The Beast is never abusive of Beauty in the tales--in fact, the prince in many Cinderellas is downright horrendous, run away, fast, Cindy! And you haven't been around the early Sleeping Beauty if that is romantic to you. Do you want to marry someone who impregnated you while you were asleep? No! Beauty doesn't try to change him. Her initial goal is to spare her father's life, not change a beast. She tolerates him with compassion and comes to love him as she grows to know him. Then ONLY his physical is changed and he becomes who he truly was all along. Sometimes he is enchanted to appear dumb, too, but he isn't and she learns to sense even that. Really, Villeneuve and Beaumont wrote a lovely story. Beauty is never afraid of the Beast after that initial first appearance. She doesn't feel threatened and he is even patient, never forcing himself upon her, especially physically. She wouldn't say no to him repeatedly if she were afraid for her safety. So what are your reasons for loving this tale? Or what is your favorite tale and why? Strangely, I think my favorite fairy tale is The Twelve Dancing Princesses--because I always wanted a lot of sisters! Robin McKinley's Beauty is my favorite book. I discovered it as a freshman in high school, and have read it many more times then I can count since then. I love everything about it. Beauty especially is my all time favorite female character of all time. I think it is because at the beginning she doesn't see herself as beautiful, and refuses to believe the words of anyone else about her looks. She is strong and smart, and loves reading, as I do. The descriptions of the Beast's library alone sends me into fantasies. What a dream such a place would be! I was jealous of Beauty that she got to experience it. And as a costume lover, I couldn't help but love the descriptions of the gown's that are brought forth for Beauty's approval. And I want a ring like the griffin ring that the Beast sends to Beauty. I can not find one anywhere that matches the picture of it I have in my mind. I may have to one day have a jeweler make one for me. Just writing about it here makes me want to grab my now dog eared copy and read it all over again. I may have a great love for The Wizard of Oz, and The Phantom of the Opera, but this book will always hold the top spot in my favorite book list.